At Geelong Pest Control we frequently are asked by builders, and owner builders alike, when is the best time to get a termite prevention treatment done when building? The answer is Pre-Construction!! At Geelong Pest Control we frequently are asked by builders, and owner builders alike, when is the best time to get a termite prevention treatment done when building? The product is designed to act as a physical and chemical prevention system to deter termites gaining entry into your home. The product is impregnated with a chemical called Bifenthrin, which is a tried and tested termite repellent. Homeguard Blue is also manufactured right here in Australia. The installation process is broken down into two stages, Part ‘A’ and Part ‘B’. Part ‘A’ installation consists of our technicians arriving once the concrete preparation is complete eg. 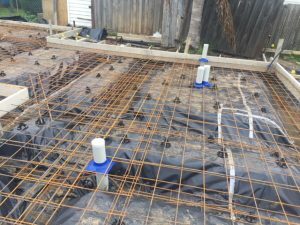 All tarp, Rio steel and boxing is complete with the penetrations or plumbing in position but without lagging if possible. Then our technicians will install collars on all the penetrations before the concrete is poured to limit termites creating mud leads on the outside of the pipes to gain entry. Part ‘B’ installation is applied once the concrete has cured or set, then the chalk lines should all be clearly marked to help our technicians see what areas need Homeguard Blue or areas you’d like us to avoid. 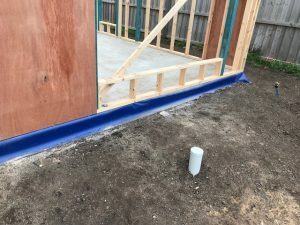 Then we would apply the Homeguard Blue roll around the edge of the slab, which would sit under the bottom plate and then tie in with the brickwork if it were a brick veneer home for example. This is designed to limit the access to the bottom plate through any cracks in the mortar. What are the benefits of applying these products opposed to the old spray methods? The industry standards have changed which has limited our ability to apply spray treatments at the construction phase, and for good reason. Treatments conducted via a spray are typically disturbed heavily after hand over, due to landscaping, concrete pathways and driveways being added. This will almost definitely completely remove the termite management system or remove large amounts of soil that have been previously treated. What is the warranty period for Homeguard Blue PB? Homeguard Blue PB has a 50-year product warranty, as per Australian pest control industry standards, there must be annual inspections to uphold this warranty. You will typically receive a letter in the mail or an email reminding you to have your annual inspection conducted. There will also be a sticker installed in your meter box that will outline what date the products were installed and what products were used, outlining batch numbers and date of manufacture for the product. In some cases at the building phase, a meter box may not have been in place at the time of installation, so you can contact the provider and they can organise a sticker to be added. Is Homeguard Blue PB an option for extensions? Absolutely! 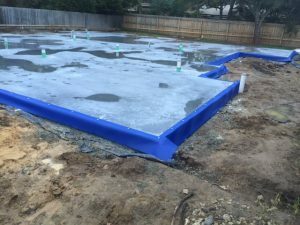 Homeguard is also a great option for a slab that will be poured as an attachment to an existing home. Call us to find out more. Can Homeguard Blue PB be used for a home on stumps? Yes! 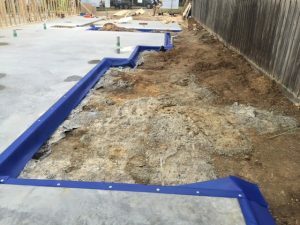 Homeguard blue can be used with concrete stumps under the ant caps. To find out more, call us. For more information and proof that we are an accredited user of Homeguard Blue PB go to the Homeguard website. Please provide your details and one of our friendly staff will get in touch with you.